The Town of Mono is Ontario's cycling jewel. Located North and East of Orangeville, Ontario, Mono offers unparalleled vistas of the sheer cliffs and rolling hills of the Niagara Escarpment. Now imagine the roads strung together into a visually stunning epic route with challenging climbs and thrilling descents. All you have to do is concentrate on the beauty around you. Get ready because it's about to happen this fall. Experience Mono on a Bike = “MOAB” - on Sunday, September 23rd! Mono, in partnership with the HB Cycling Club, will be hosting a cycling tour designed for all ages and all cycling skills. There will be four tours, starting with an easy 5 kilometre pedal through Mono Cliffs Park for children, plus a longer 15 kilometre course. For the more adventurous, there will be 32 kilometre ride that will cover some of Mono's more inspiring roads and hills and a few off-road sections. And, for the real hard-core cyclists there will be a 64 kilometre ride that will test your mettle and cover most of Mono between the 5th and 30th sideroads. All four tours are designed for hybrid or mountain bikes - road bikes are not suitable for the gravel roads and some of the off-road parts of the courses. All four cycle tours will start at 10:00 a.m. at the Mono Community Centre located on Mono Centre Road (Dufferin County Rd #8) in the hamlet of Mono Centre - right next to the Mono Cliffs Park. Registered riders will be chip-timed and there will be 40 to 50 volunteers along the route guiding cyclists. For the two longer tours, there will be rest stations offering water and other amenities. All four tours finish back at the Mono Community Centre where riders will be given food and drink. There will also be a beer garden and live music. 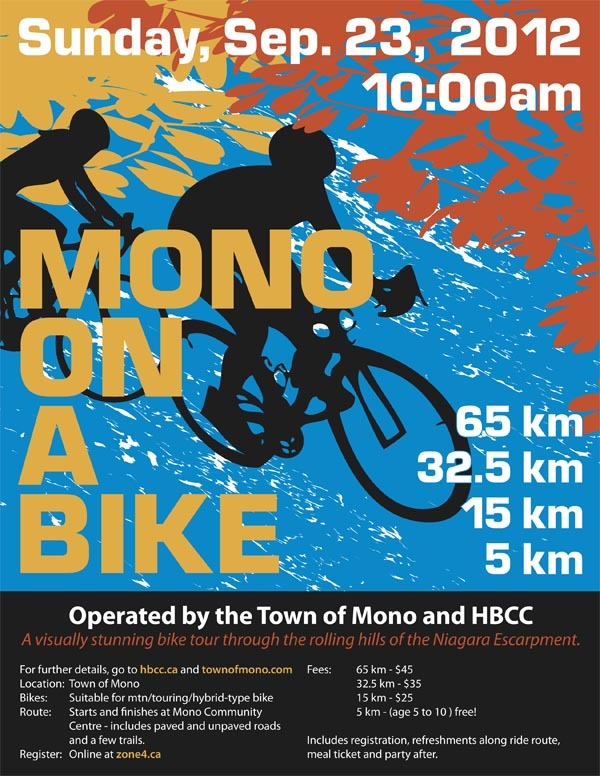 Mono residents who don't want to register, but who may be accompanying some of the riders or who just want to see the fun and excitement are invited to come out to the Community Centre. Food, drinks, beer, live music and other activities will be available between approximately 10:00 a.m. and 6:00 p.m. The fees are designed to cover the costs of the event (including insurance) and were set with a 'break-even' budget as the goal. So mark September 23rd on your calendars and COME ON OUT!